When I craft I often think of other women who make or have made similar things. I wonder if they held the needles the same way, if they were annoyed by the same things, and all the other random thoughts that can go though one’s head when tightening up a thread just so. When making the little doily in this photo I wondered how many other women have made the pattern. Were they bothered by the change in look of the stitches when the design stops going round and needs to go back and forth to make the points. I have on other doilies remembered to turn the work even in the round part for just that reason. I didn’t remember this time. Most people wouldn’t even notice I suppose, only doily makers, the people I most want to see my work. 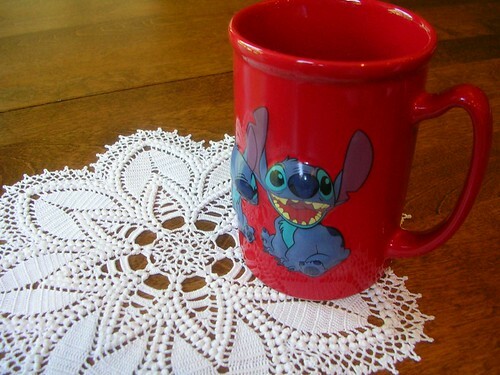 As for the mug in the photo, well I love the character Stitch, precisely because his name is Stitch. This entry was posted on Sunday, November 2nd, 2008 at 4:30 pm and is filed under Crochet and Lace. Tagged: Crochet, Doily, Thread. You can feed this entry. You can leave a response, or trackback from your own site.